Today, I woke up to a similar (bathroom) experience as the day before yesterday. I figure at least the person uses the same shower everyday, marking his/her territory. I wonder if someone will find out who it is and knock all their teeth out? I hope so. I used another of the 4 showers, and have only been showering every other day to lessen my chances of contracting E. Coli, or something worse. My small can of Lysol is worth every one of the 399 pennies I paid for it. 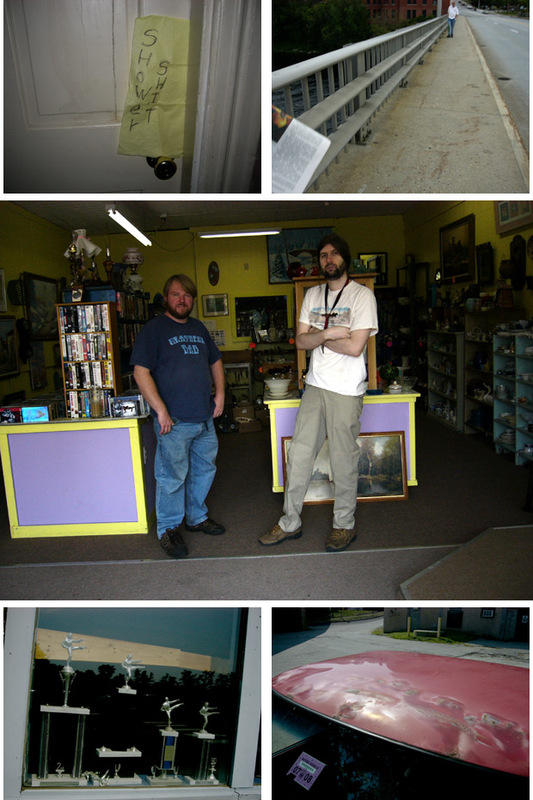 I went across the bridge to get some primer and met Brandon and Dave while I was walking past Brandon's antique shop. Antiques are big up here. Lots of old stuff. Old. Me. I'm getting older. I'm sitting here aging. I talked to Dave for a while about the wars in Afghanistan and Iraq. He implied that there weren't many activists up here. I agreed with him.